An Interactive Guide for Learning to Play the Native American Flute. Includes Instructional text, CD and 25 Songs by John Vames. 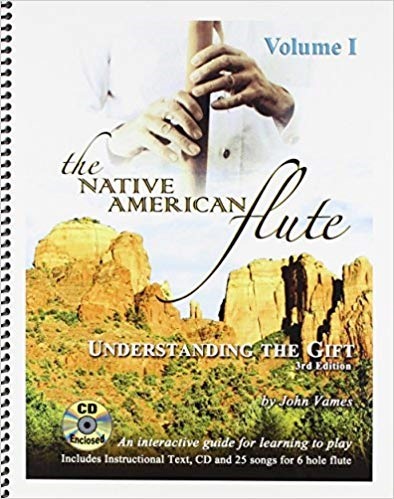 For all students of the Native American Flute: for the Beginner who has little or no experience, the Intermediate player seeking further knowledge of how music works and the Advanced player who wants to teach others but up until now did not have a clear-cut format to do so successfully. PART I – Easy to follow instructions include lessons on finger control, breath control, knowing your flute, embouchure, basic notes, tonguing & slurring, the Native American Scale, creating your own melodies, ornaments, duration, reading Music, Nakai tab, and the Major Scale. PART II – Includes 25 songs arranged for Native American Flute: Traditional, Native American and Original. Appendices include useful Scales for practicing, Analysis of the Major Scale, Rhythmic Values and Care of your flute. Includes 39 track interactive audio CD demonstrating all.